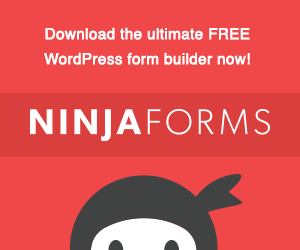 In this article, I’ll give you an inside look at the new Ninja Forms WordPress tutorials from WP101, a quick overview of the Ninja Forms plugin, and a special offer. I’ve been a subscriber and follow of WP101.com for a long time. When they launched their WordPress tutorials, they filled a huge need in the market! Today, they are still, in my opinion the best provider of WordPress and WordPress solution tutorials. It’s NOT just for beginners, so don’t click away yet! WP101 has a nice range of courses. If you’re a long time WordPress user, their WP tutorials might not be for you. However, they are constantly branching out and creating tutorials around some of the most popularly used plugins in the WordPress market. If you’re going to use WooCommerce or Yoast SEO, you will for sure want to take these courses! I don’t care your level of experience! If you’re a developer and you want to minimize the amount of time you have to spend to get a customer educated on WordPress or any of the plugins listed above, WP101 has a plugin you can install into the customer site, allowing them to have access to these video tutorials any time! Here’s a quick overview of what you can expect! While I believe Ninja Forms to be a relatively easy to use plugin to use, it does have some complexity. Some of the addons and advanced features really unlock some powerful features. That is where I think this course is going to add the most value. Although, I have helped plenty of people get the basics of just setting up a form that actually sends an email notification 😉. That’s where the WP101 plugin comes in nicely! They have kept the interface and course dashboard very simple. Get right to your content and get the info you need to succeed! The Wrap Up & Special Offer! You can buy this course for $19 or an All Access annual subscription for $49 per year! The price is ridiculous! You get the best WordPress tutorials for only $49 per year, which is already a special deal! There is no why I can justify asking Shawn for a discount on an already crazy affordable price for my readers. BUT! What I can do is offer you 3 months free for any of our annual support plans at myWPGeek.com. You should have both of these subscriptions any way! You must purchase any of the WP101 courses or All Access Pass by click on my affiliate link! You must send me an email, chris[at]mywpgeek.com letting me know which course you signed up for and which support subscription you want. I will send you a custom link to then signup for your free 3 month annual subscription of myWPGeek Support. You could also purchase the WP101 Plugin to qualify! As always, please use the comments below to ask any questions or provide any feedback.